The Northern Sierra Air Quality Management District has released the numbers for the month of February, with rain and snow dominating the majority of the month. 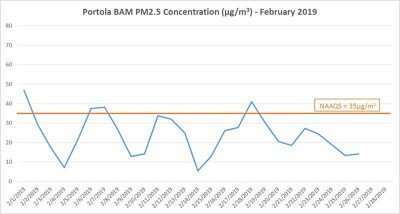 There were four daily exceedances of the National Ambient Air Quality Standard for particulate matter (PM2.5) during February. According to district data, this is similar to previous years. There were six days of exceedances in February of 2018, five days in 2017, and 10 days in 2016. 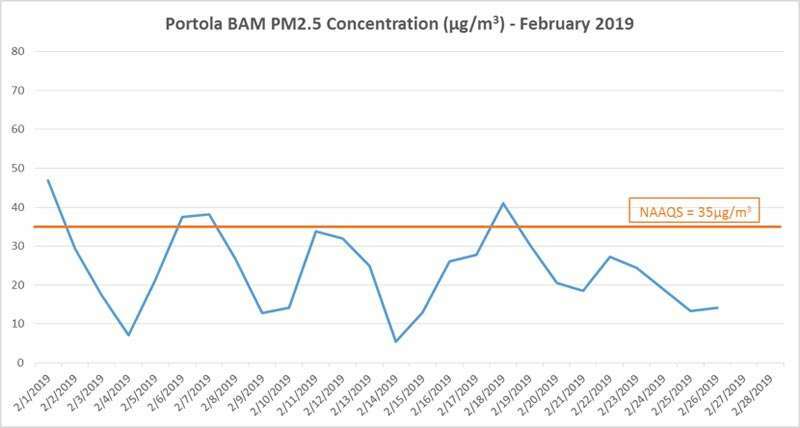 Average daily PM2.5 for February was 24 (micrograms/cubic meter), compared to 29 in both 2017 and 2016, so values are trending down a bit. The rain and unsettled weather through the month made for good smoke dispersion. Portola had 6.44 inches of rainfall in February (21 days of measured precipitation). This is much more rainfall than the 1.17 inches recorded in February of 2018, over six days of precipitation. Once all is totaled, February 2019 had more than 150 percent of normal rainfall. Looking ahead, normal fire potential is expected through May, and above normal at some lower elevations that will see a large crop of fine fuels from all the rain (per Northern California GACC, 3-1-19). Snow pack is now upwards of 170 percent of normal, with potential for snowmelt flooding in April and May, according to NWS Reno Water Supply & Spring Flood Briefing, 3-7-19. 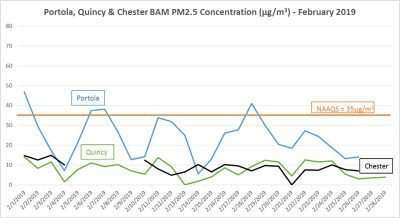 A comparison of the three monitoring sites in Plumas County (Quincy, Chester and Portola) shows that Portola consistently has higher levels of PM2.5 in the winter than both Quincy and Chester. There were two days in February that Portola residents were asked not to burn in uncertified wood stoves, fireplaces or conduct any other wood burning. Proper burning in EPA certified heating devices only is encouraged. This is due to inversions keeping smoke in the breathing zone, particularly during the overnight hours. Long Valley Charter School and the air quality management district jointly issued a press release announcing a partnership with the EPA Air Quality Flag Program. Students raise a flag daily to notify the public of expected air quality. Suggested actions to protect health are described based on the flag color, known as the Air Quality Index. 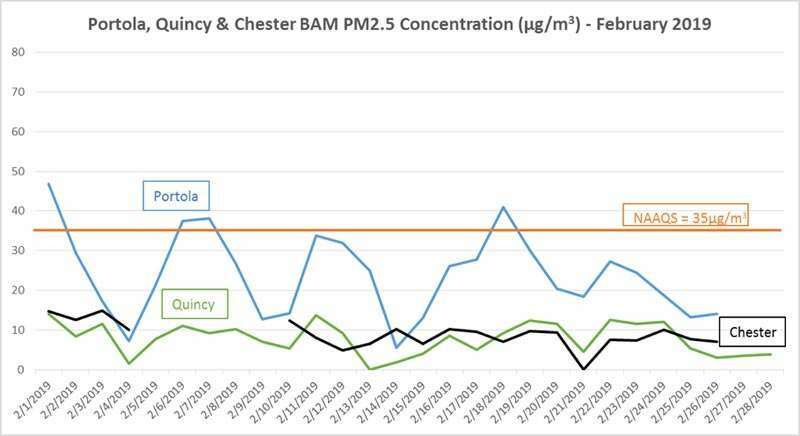 When the flag is orange, red or purple (meaning that PM2.5 is likely to be above federal and state standards), a health advisory is posted, and residents are asked to refrain from wood burning. As of Feb. 28, 360 applications have been received for the change-out program, 334 pre-approval letters have been sent out, and 285 installations are complete. For more information about the program, contact Julie Ruiz at 832-0102. For real-time air quality, visit myairdistrict.com.